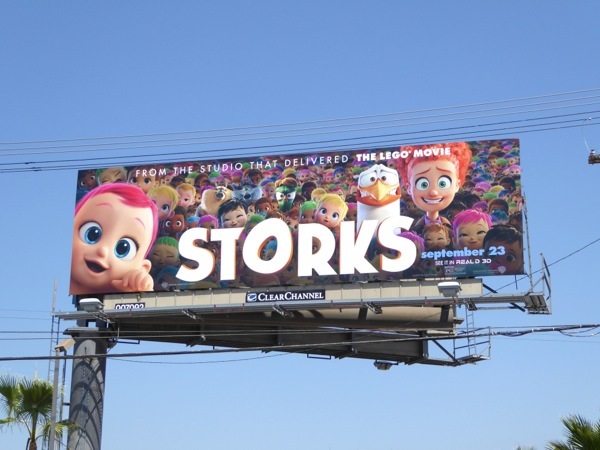 Storks may not have soared as high as The Magnificent Seven at the box office this weekend, but the animated movie seemed to score with cinema goers based on reviews, so the newcomer may still have a chance to fly high in the coming weeks. 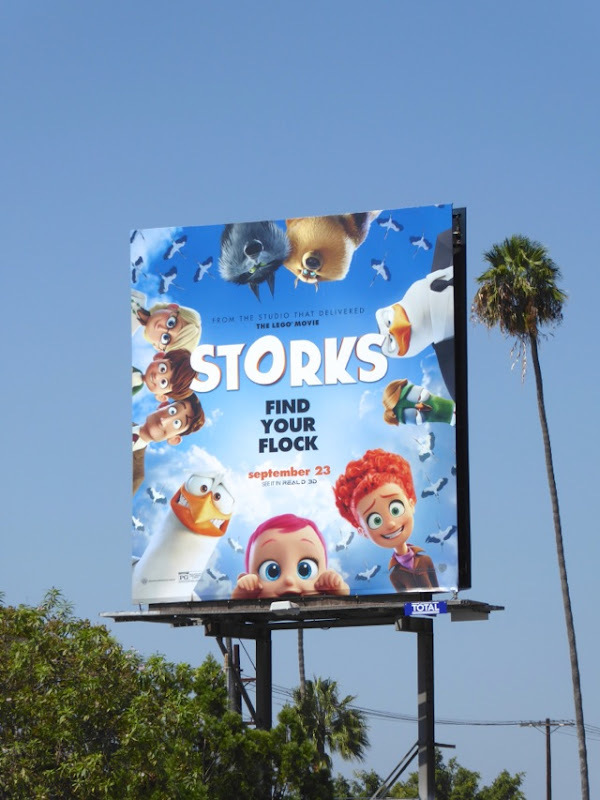 The second film from the newly formed Warner Animation Group, which also delivered the highly successful The Lego Movie, Storks reveals that although the birds used to deliver babies, they've moved on and now deliver packages for Cornerstore.com. 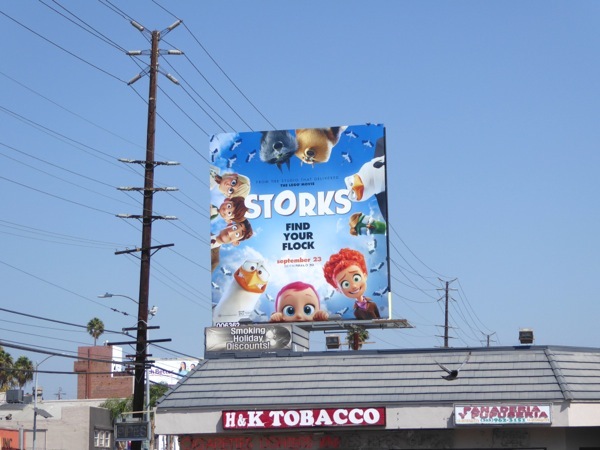 When the baby making machine at Stork Mountain produces one unexpected child, the company's best delivery stork, 'Junior' (voiced by Andy Samberg), must make his first baby drop with his orphaned human friend 'Tulip' (Katie Crown) and help make one family whole. 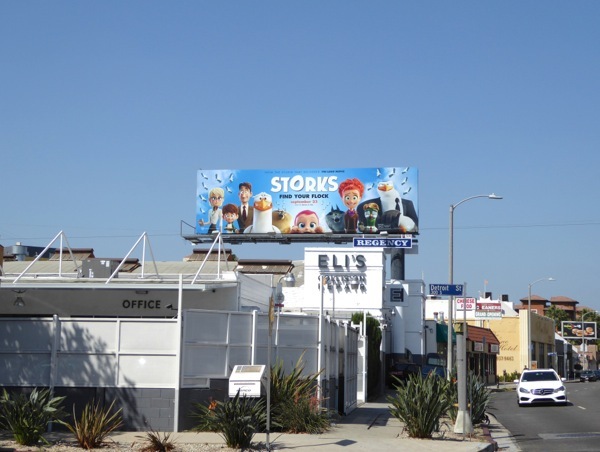 The computer-animated adventure also features the voice talents of Jennifer Aniston, Ty Burrell, Kelsey Grammer, Key & Peele and more besides. 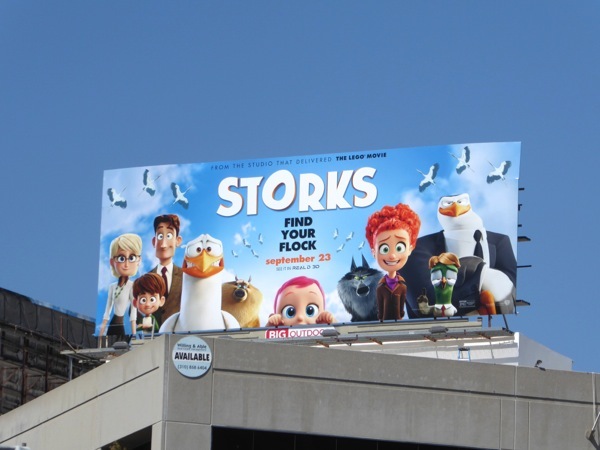 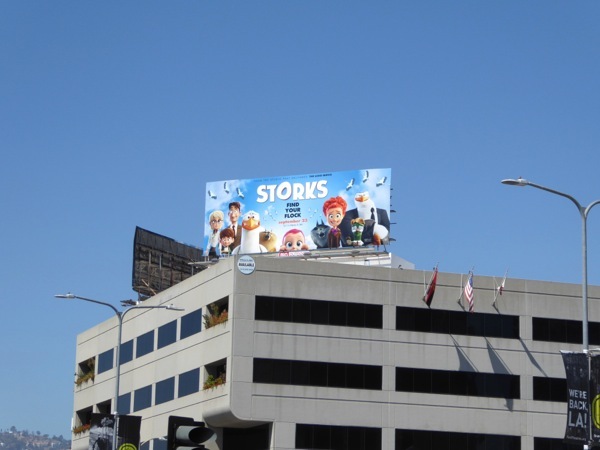 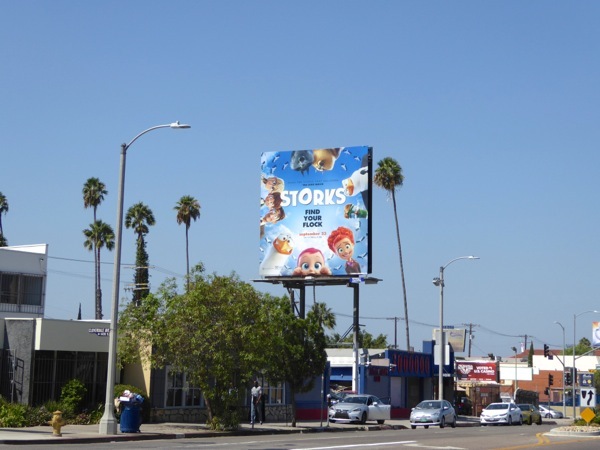 These fun Storks movie billboards were snapped around the streets of L.A., including along Cahuenga Boulevard, Melrose Avenue, Pico Boulevard, La Brea Avenue, Santa Monica Boulevard, 3rd Street and San Vicente Boulevard from September 3 to September 7, 2016. 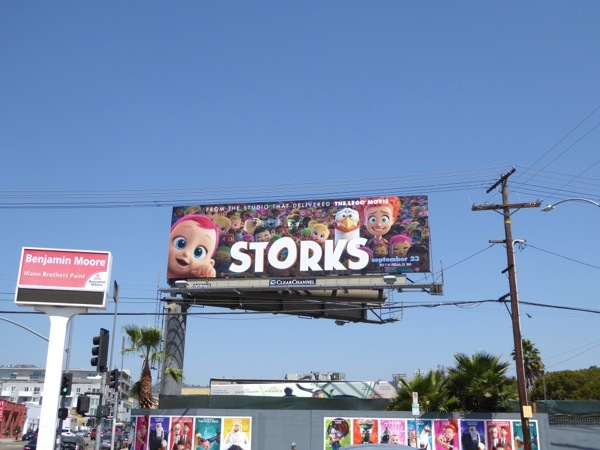 The square versions of these outdoor ads also remind us of these movie billboards for The Boxtrolls from 2014. 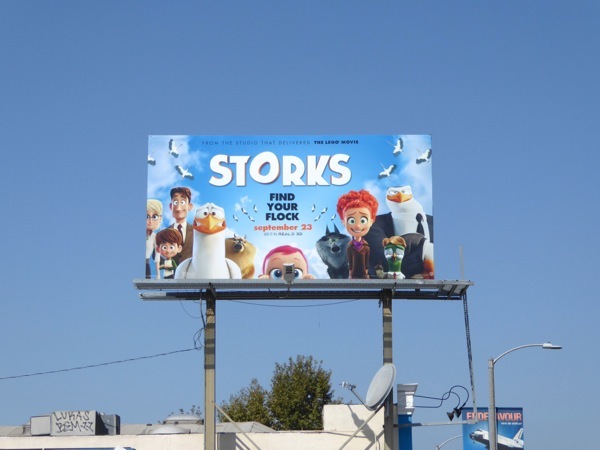 Plus for more animated hijinks of the feathered kind, make sure you also check out these Penguins of Madagascar movie billboards, these billboards for The Angry Birds, these Free Birds movie billboards and these Happy Feet Two film billboards. 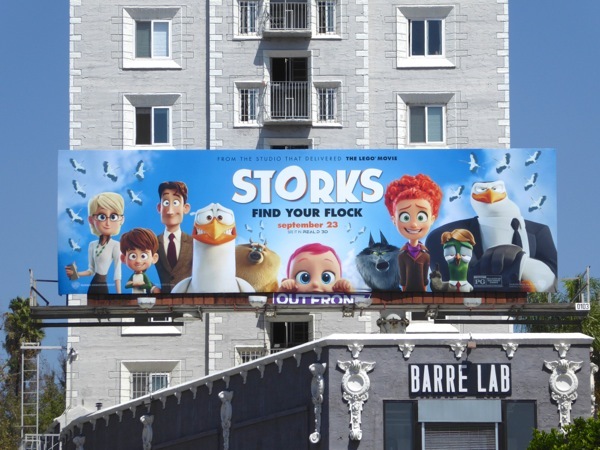 Now at least when your kids ask you where babies come from, you'll have a family-friendly film available to answer their curious questions.